Matthew Taylor received his B.F.A. in Metalsmithing from the renowned Maine College of Art. His thesis, authored in 1993, is titled “Moving Metals: Raising and Anticlastic Raising.” Matthew’s time at M.C.A. allowed him to discover his talent for working in three-dimensional form with metals. These talents furthered by his ability to free-form carve jewelry and other sculptures in wax-relief prior to casting them in metals. 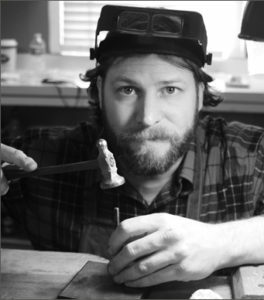 Matthew’s amazing artistic skills and passionate personality allow him to not only create beautiful one-of-a-kind pieces of jewelry for his clients, but give them an experience they will never forget. Matthew takes the time to get to know each of his clients to ensure he creates a piece that they will love and captures their story. Matthew’s jewelry are pieces of art, pieces that will be shared with family for years to come. Matthew calls Shelburne, Vermont home with his wife Brianne Taylor and their two daughters. On many occasions you will find one, or all three, of his girls with him in his studio, keeping him company and helping with the store so that he can have the time he needs to focus on the fine details in his pieces, from start to finish. Click to visit Matthew’s website. Matthew and Brianne were drawn to Tracy’s spirit and story. They became inspired to help her vision of sharing compassion with others. Matthew’s artistic sense allowed the Peaceful Buddha necklace to come to life. Hand carved, using a lost wax process, and the sourcing of amazing gemstones, ensure the Peaceful Buddha Necklace & LLCF’s Buddha Buddies Jewelry Line is made with the same compassion it shares with those who gift or wear it. Lily was raised in Shelburne, Vermont surrounded by an artistically nurturing community and family. She studied at the University of Colorado Boulder in one of the country’s renowned advertising programs and has been designing jewelry for years. Aside from the Love Light Compassion Foundation offerings, Lily’s designs can be found at boutiques in both Shelburne and Burlington, Vermont. Her inclination towards creating and designing stems from her mother’s precedent and encouragement at a young age, which was then furthered by her experiences traveling to colorful and exotic places. After visiting Nepal and seeing the ornately detailed metalwork of the local artisans, Lily fell in love with the Asian style and became very drawn towards the Karen Hill Tribe silver, especially the ‘chakra flower’ representing balance and prosperity. She has been able to source these beautiful pieces in a manner that supports and respects the Karen people with fair trade practices. Making jewelry has become her favorite medium, which has been utilized greatly since her introduction to Tracy. Having this love for jewelry, while having also been directly affected by both the emotional and financial burdens of medical needs, her place at Love Light Compassion Foundation seemed inevitable. She was drawn towards LLCF by the beautiful and philanthropic soul of the Foundation and hopes her designs may bring both sparkle and peace to anyone in need.